Holding each of these books is a pleasure. Their two-tone covers have different but complementary botanical design motifs while the master design elements of the UWAP Poetry series, pushing on 23 titles, of which they are part gives them a uniform appearance. They are a credit to Terri-ann White and her team at UWAP in Perth. The miserably small print runs for volumes of poetry often lead to scrimping and saving on design and production, but here at least design costs have been defrayed over the entire series and it pays off in the look of the finished product. Inside, the paper is cream matt with sufficient weight to limit show through, an important consideration for a poem set out upon a page. Again, each book has the same interior design. The font is specified as Lyon Text, one unknown to me but a serif font bearing a close resemblance to Times. It is elegant and does justice to both poets’ poems. It is interesting to see different uses of capitalisation in the titles of the poems in each book, suggesting that editorial style was sufficiently flexible to accommodate each poet’s personal preferences. Both books also feature extensive notes on the poems, acknowledgements and a liberal use of epigraphs. There are also endorsements from other poets both within the books and on the covers. 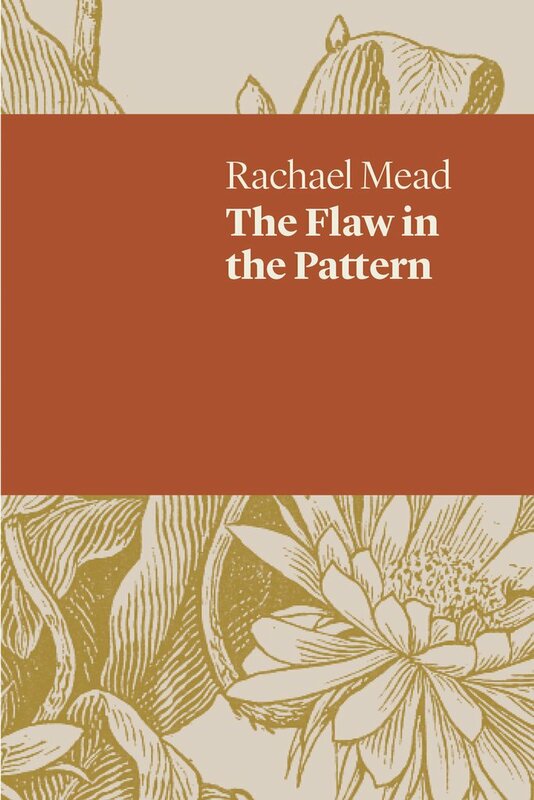 Rachael Mead’s book, The Flaw in the Pattern, was first highly commended in UWAP’s 2016 Dorothy Hewett Award for an Unpublished Manuscript.1 It is easy to see why. There is a continuity to the sequences of poems within, surprising when the acknowledgements reveal how widely published the individual poems have been, not only within Australia but internationally. The book opens with a sequence of seven poems, ostensibly each from a day on a trek though Tasmanian wilderness. As the poems progress the poetic voice grows more accustomed to the bush and natural environment (‘If I misspoke, if I held eye contact too long, these trees don’t care’ ‘On not being lost’ p.17). To me, some discords sounded in literary and artistic references almost forcing themselves into the poems. A reference to Emily Dickinson just works in an image of leeches as dashes she would covet (‘The wild grammar of leeches’ p.16) but a reference to being in a McCubbin painting in “On not being lost’ is an image too far for me. However, that is a rare misstep for Mead and a forgivable one in an otherwise flawless poem. Then there are the poems like ‘The water tanks’ (p. 63) which have no such quibbles. Here, those iconic constants of rural Australia are transformed into saviours ‘still cool and full, standing guard/among the fresh acres of ash.’ ‘What the fire didn’t touch’ (p. 47) doesn’t mention the flames. Instead, it recounts the scenes after a domestic fire, the family home ‘a charred nest’, a childhood bedroom now ‘a post-apocalyptic theatre set’. Fire also features in the final poem in Mead’s book, the five-part ‘Smoke signalled death threats’ (p.87). This poem chronicles the stages of a bushfire from ‘the drone of fire bombers’ to the uncertain ‘survival plan burned out with the pump.’ The final part, ‘Next of kin’, also contains the superb opening lines: ‘Morning drags itself in like a wounded soldier/but I’m taking no prisoners today’ (p. 90). Philip Neilsen’s Wildlife of Berlin is arranged in five sections, though this is not indicated on the contents page. The reason for the sections is theme. The first section deals, broadly, with love and death; the second contains poems that feature birds, though this is a far from adequate description of the beautiful poetry therein; the third section, often in first person, features character narratives with poignant humour or sharp irony as in ‘The University Makes a Poem (‘a student seen reading Proust on the quadrangle lawn/is hailed as a guru’ p. 58); section four contains elegant musings, some such as ‘Testimonial’ (‘You wrote today of loneliness. / But I did not like you then, / I would not like you now’ p. 73) revealing the poet’s darker side; while the last section almost wearily ponders youth, aging, climate change hope and regret. The poems traverse the world, but Queensland is a constant throughout, not merely as a lace but as a state of mind. Take ‘Guitar’(p.64), for instance, set on Kelvin Grove Road in Brisbane at the scene of a traffic accident witnessed by the first person narrator; ‘A man in shorts comes out of the nearest house’. What else would a man in Queensland wear? Nielsen’s humour is apparent in ‘Messaging’ (p. 90) where in seven two line stanzas he flays those who ‘peck at their phones like birds’. Again drawing on digital technology for thematic material, he also flays an apparent rival poet in ‘My Enemy has asked to be Friended on Facebook’ (p. 96). This is a gleefully malicious poem: ‘your chagrin at being passed over, failing/to make a bigger splash in the shark pool of poetry –’. I laughed out loud at that frank image; it evoked so many memories of overblown egos waiting their turn to bore each other stupid in dank and chilly rooms. Both of these books are fine contributions to Australia’s literary culture. I shall return to each with pleasure. What I particularly enjoyed was how contentedly Australian each is. Both show that the poets are worldly; Neilsen’s title references the German capital and other European locations feature in his poems while Mead has the Cook Islands and Antarctica as settings. Yet Australia is home. For Mead, it is the Western states: ‘The eastern states seem separate as islands.’ (‘Homecoming’ p.29). For Nielsen, it is Queensland’s beauty and ugliness that underpins his poetry: ‘By the mangroves/at the far side of the airport, a steel crane/like a stranded stegosaurus lifts its head’ (‘Sunset at Brisbane Airport, p. 70). Each book is dangerously familiar, and we could ignore their place poems for foreign places. However, I recommend them as guides to a current, vibrant Australian literary consciousness. This entry was posted in BOOK REVIEWS and tagged Jeremy Fisher, Philip Nielsen, Rachael Mead. Bookmark the permalink. Jeremy Fisher teaches writing at the University of New England. His works include the novels Music from another country and Perfect timing (for young adults), which has been translated into Vietnamese. He is a former Executive Director of the Australian Society of Authors.